Provide comfort for the family of Regina Howland with a meaningful gesture of sympathy. Born in Wilmington, Delaware on September 17th, 1942; departed this life on Tuesday, November 27th, 2018. Home going services will be held Thursday, November 29th, 2018. Home going services are private. To send flowers in memory of Regina T Howland, please visit our Heartfelt Sympathies Store. 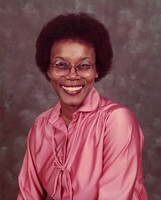 Provide comfort for the family of Regina T Howland by sending flowers.